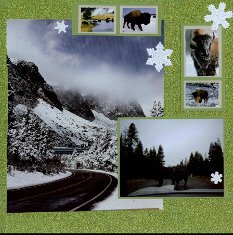 Yellowstone National Park is one of the most beautiful & unique places on earth & here are some ideas for making your Yellowstone Park Scrapbook a real looker with Yellowstone Scrapbook Layout & Supplies, Papers and Embellishments and where you can get them. 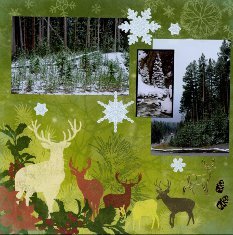 This first layout or inside cover sheet for our Yellowstone Park Scrapbook was made with a background paper from Karen Foster designs called Pine Border with wood grain and a green border with pine cones and branches. The Die Cut Title is the most amazing one I have ever seen. It must be nine or ten layers of paper representing the rocks and trees, a special white padded cut out representing the waterfall with a metallic piece behind it that glistens if you move the page. It actually looks like the water is falling. The green trees are cut from a felted paper. I purchased this from Scrap Your Trip.com along with similar ones for the Grand Teton National Park and another for Mount Rushmore Memorial. The photo is a larger postcard purchased from one of the Gift Shops in a package of 12. Normally I would have used the Traditional photo of Old Faithful, but I decided to be different and use a photo of the Upper Geyser Basin and save my Old Faithful postcard photo for the next layout. Scrapbook Advice Tip: It's OK to use Postcards that you can purchase. Not only are they wonderful photos, but they contain some great text for journaling ideas. 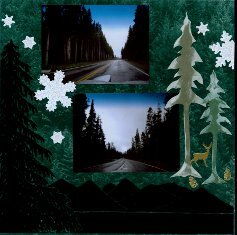 I did this through out the Yellowstone Park Scrapbook. The beige torn stickers on the right came from a Yellowstone Scrapbook Kit that I purchased. One of the stickers was pre-printed with information about the Grand Canyon of the Yellowstone, the other was left blank and contains handwritten information that was actually on the back of the post card next to it. 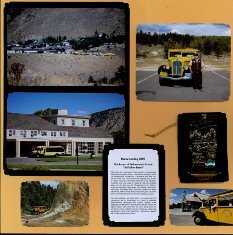 In 2007 Yellowstone Park brought back the Yellow Tour Buses originally from 1936. They were sold off in the 1950's but eight were bought back, refurbished and are now in service. 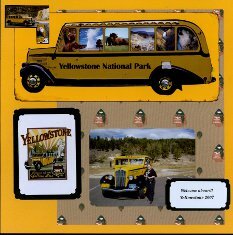 These Yellowstone Park Scrapbook Layouts are devoted to the Yellow Bus Tour. The background papers were a yellow card stock, the same color as the bus with the addition on the left page of an 8 1/2 x 11 inch paper featuring the National Park logo on a brown background that came with a National Parks Scrapbook Kit purchased several years ago. The photo of the bus at the top was a post card purchased while at the park. It is actually a photo cropped around the outside of the bus. The white embellishments were the parting gift from the tour and a brass ornament to commemorate the occasion. Arrival at the Lake Hotel area presented some interesting events. These next 5 pages tell the story of arrival just at sunset, the fury of the weather change from 85 to 35, the onset of wind which brought sleet and snow, and the Buffalo herd whose presence made for an interesting night and morning. 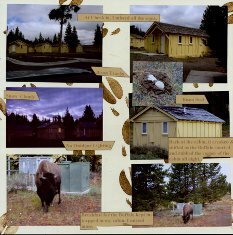 All 6 layouts use plain background paper that has been stamped with a Buffalo Track Rubber Stamp picked up at the Ranger Station at the Norris Geyser Basin area. 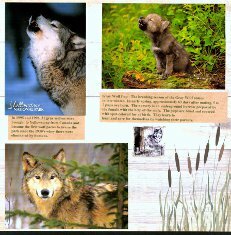 These first 2 pages on the Yellowstone Park Scrapbook Lake area use a combination of 3 purchased post cards and my own photos. The journaling sheet about the Lake Hotel history was picked up at the hotel during a tour. The frame around the photo on the upper left, the yellow tag and the oval Yellowstone Lake sticker were all purchased as part of a Scrapbook Kit found in the Lake Hotel Gift Shop. 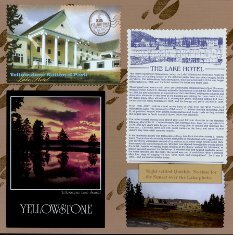 These next two layouts of the Yellowstone Park Scrapbook are jammed with photos of the Lake Cabin for the night’s stay and all the Buffalo found in the morning that actually prevented leaving the area for several hours. The Buffalo were around the cabins all night as I could hear them snorting and occasionally one would rub against the edge of the cabin for a good long scratch. Some of these photos were taken through the window screen as they were only 3 feet from the cabin and with cows and calves, I wasn’t about to venture out as they were between me and the car. I did manage to get the car packed without being gored! Scrapbook Advice Tip: Putting so many photos on these 2 pages, many had to be cropped and left no room for a journaling block. I printed the journaling in short sentences, and then cut them into strips, and added the journaling strips on top of the photos. 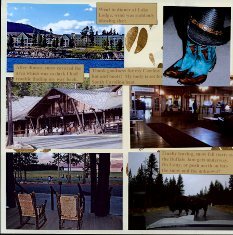 This last Lake layout in the Yellowstone Park Scrapbook finished up the story of the stay at the Lake area with photos of the Lake Hotel from the Lake, the Lake Lodge inside and out, as well as photos of the boots and hat that saved me from the sleet and snow. The final photo shows my attempt at departure with more buffalo on the road in front of the car and more snowing. Journaling with the strips finished out the story of the stay. This page is shown without the companion page that has photos of children that I choose not to post on the internet. 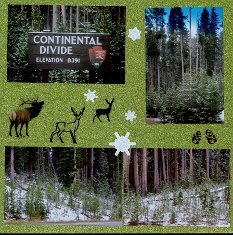 These next 6 Snow Layouts in the Yellowstone Park Scrapbook document part of the trip from the Lake area up to the Mammoth Hot Springs area concentrate on the late August snowfall. Being from South Carolina, the snow was a wonderful and unusual experience. The last time I was in Yellowstone, we were snowed in over the July 4th holiday. I have heard that it can snow in Yellowstone every month of the year. Normally when I have an opportunity to scrapbook snow photos, I use a blue background. This time, since there were so many trees in the background, the photos had lots of green and I decided to put all these on green, using printed and green glitter backgrounds. The background page on the left with the deer is called Reindeer Bells from the Joys of the Season collection by Moxxie purchased at the local scrapbook store Busy Scrappin at 1025 Galvin Rd. S., Bellevue, NE 68005. Busy Scrappin was a very nice store with a big selection of products and a huge cropping room. Also found there was the Lime Green Glitter from Best Creations, Inc on the opposing page and the next 2 layouts. 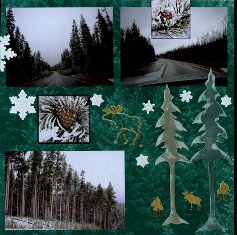 Also used on these Yellowstone Park Scrapbook pages for Embellishments were some self-adhesive Die Cut Snowflake Glitter Stickers called Christmas from Reminisce for $2.50 also from Busy Scrappin. Also included is an Elk sticker purchased at the Jackson Hole Visitors Center for $.75 and several gold and brown Dazzles from the Outdoor Collection purchased from Paper Wishes. Scrapbook Advice Tip: One photo on the left page was printed in a small format in black and white, matted on black, to accent the drama of the snow. This idea was used on all the pages in the Snow grouping. These next two Yellowstone Park Scrapbook layouts use the Lime Green Glitter from Best Creations, Inc. and matting in a Lime Green from my stash of paper. The photo on the left of snow on the road to Carbon county, Wyoming was from the Wyoming 2010 Official Travelers Journal. I reprinted the photo from the magazine, but unfortunately I could not find a credit for the photographer. The photo on the left of the Buffalo in snow was from the Wyoming 2011 calendar - photo by Dewey Venderhoff. When the snow got deep, I was concerned about pulling off the road and trying to take photos of the trip, so I used these photos to add to my scrapbook some of the wonderful things I had seen and included them along with mine. Scrapbook Advice Tip:The rest of my snow photos were grouped together in a small flagbook at the bottom of the right page. When put into the sheet protectors, the sheet protector will be cut to allow those photos to be accessed. Enbellishments used were 4 Buffalo stickers from Mrs Grossman’s Wild Animal Stickers, a green and white Tree with Snow Diecut that came from my stash, more of the Die Cut Snowflake Glitter Stickers and a small accent photo matted in black. 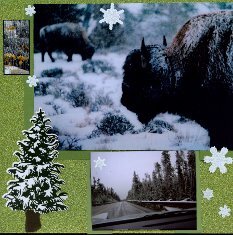 Background paper for these two Yellowstone Park Scrapbook layouts had a pine tree watermark image and are from Wubie Prints. The left page also uses a transparency showing the outline of the pine tree and mountains in black and is called 7001 Mountains by NRN Designs. Embellishments on both pages consist of the Die Cut Pine Trees that have been enhanced with White Pigment Ink and Pearl Perfect Pearls. Also accenting the page are the rest of the Die Cut Snowflake Glitter Stickers, and more of the Gold Outdoor Dazzles from Paper Wishes. Two small accent photos of Pine Cones with snow are matted in black. 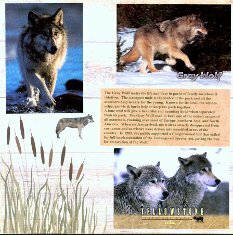 These two Yellowstone Park Scrapbook layouts of the Gray Wolf were done very simply on some background paper called Creek Bank from the Back Country collection from Paper Loft. The cattails on the double sided paper went with a lot of lake areas that I saw on my travels across this country. I like this double sided paper as both sides are the same print, only in reverse. I hate it when I like both sides of double sided paper and can't use both, but in this case I don’t feel like I am wasting the other side. The journaling from the back of the Post Cards was printed on light tan paper in a medium green ink to go with the cattails on the paper. I have followed the wolves disappearance from when I was a child and then the re-introduction of the wolves to the park and I wanted to have those details as part of the page itself and not hidden. The only other embellishments were the 2 Wolf stickers from Yellowstone Park Scrapbook Kits that I picked up while in the park. 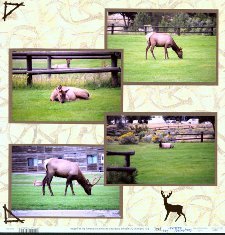 These two Yellowstone Park Scrapbook layouts of the Elk were also done very simply on some background paper called Antlers from the J Q Outdoors Scrapbook Collection by Sugar Tree. 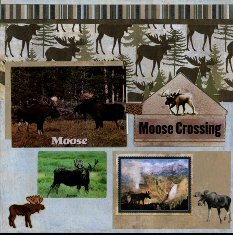 These were purchased from a local scrapbook store in Cheyenne, Wyoming - Life's Journey Scrapbooking at 109 E. 8th Ave, Cheyenne WY 82001. For both pages, the photos were mine and developed using Kodak's Pro-Metallic Glossy printing. Printing photos on this paper gives them a slight metallic look and in my opinion makes them look almost three dimensional. Photos on the left are the traditional 4 x 6 size, the ones on the right are 5 x 7. 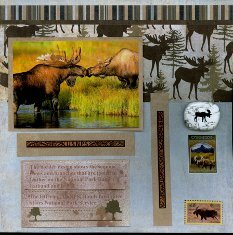 The only embellishments were some Great Outdoors Dazzles in brown from Paper Wishes consisting of the outline images of the Elk and some photo corners on the outside corners of the layouts. 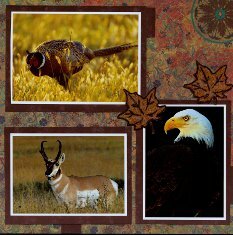 This section of the Yellowstone Park Scrapbook concentrates on the Mammals that can be seen in abundance in the park. These first two pages were done using printed background paper and burgundy paper from the Personal Shopper Kit October 2010. 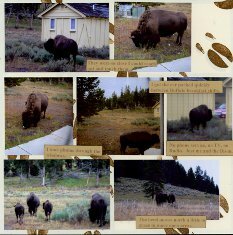 Postcards for these Yellowstone Park Scrapbook pages used were purchased at Park. Leaves were cut from a sheet of cork using a stencil received in the kit. The edges and veins in the leaf were drawn in black & red ink pen. The leaves were then sprayed with Glimmer Mist in Dreamsicle, dried with a heat gun and sprayed again. In real life they sparkle as if they have morning dew on them. 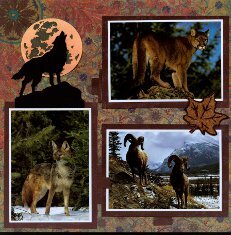 Also used is a Coyote (Wolf) Die cut from Scrap Your Trip purchased for $3.75. The white part of the moon was also sprayed with the Dreamsicle Glimmer Mist which gave it some color and helped to blend it in with the colors of the layout. Journaling is hidden behind each photo and if you look closely you can see the small tabs to pull out the journaling and is from the text on the reverse of the post card. Once assembled into the page protectors, the protectors will be cut enough to slide out the journaling. The striped and printed background paper and light tan papers are from the Personal Shopper Kit October 2010 and nicely matched these photos for the Yellowstone Park Scrapbook. Grizzly Bear page on Left - Postcards used purchased at the Park or before hand through the Yellowstone Association web site. The Grizzly Bear Stickers were from the Mrs. Grossman Wild Animal Stickers from my stash purchased several years ago for $1.29. The rusted Tin Metal Bear was purchased from Life’s Journey Scrapbooking store in Cheyenne, Wyoming where I found a lot of wonderful scrapbooking items. Cost for the bear was $2.99. 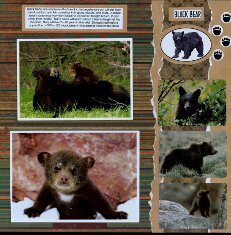 Black Bear page on Right - Postcards used purchased at Park. Black on white stickers were from a sticker sheet on Black Bear facts purchased from the Yellowstone Association store in Gardiner, Montana for $2.95. The photo stickers were from a Yellowstone Scrapbook Kit - photographers unknown. 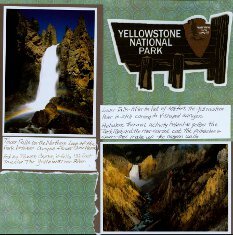 All paper for these next 2 pages from the Yellowstone Park Scrapbook came from a kit purchased from Paper Loft at July 2010 CK Convention for $6.75 which uses papers from the Back Country collection. Other kits are available at www.paperloft.com. The left page uses a post card of two Moose purchased at Yellowstone National Park, two moose stickers and 2 strip stickers from a National Park Paper and Sticker collection. Interesting trivia: The border design shows the sequoia cones and branches that are tooled in leather on the National Park Ranger’s hatband and belt. The lettering, USNPS, stands for United States National Park Service. Also on the page is a white marble “spirit stone” with a moose, purchased at the Jackson Hole Visitors Center. The right page uses a post card for the photo, as well as stickers from several collections for the National Park Paper and Sticker collection and a Scrapbook Kit purchased from the Yellowstone Association that is available in the park and on the Association’s website. 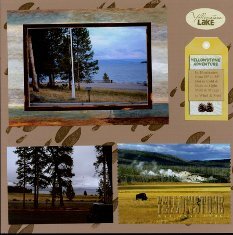 These next two Yellowstone Park Scrapbook Layouts use for background papers I received in a a package from Paper Wishes.com Personal Shopper. The Yellowstone Sign Die Cut is another item purchased from Scrap Your Trip.com and looks just like the actual signs at the entrances to the park. It is about 6 layers and I have matted it on a white background to go with the white borders around the photos. The Green Title Border Strip came with the Scrapbook kit from the Yellowstone Gift Shop as did the four post card photos. I was really impressed with the Scrapbook Kit and the large number of items included. Aside from the beautiful papers that are so pretty I hate to add photos, there were lots of stickers of wildlife, birds, title borders and journaling and blank journlaing stickers to match. Beautiful & Educational. 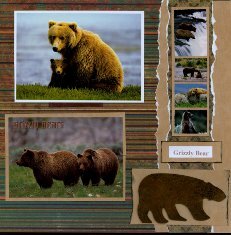 Scrapbook Advice Tip:I may use some of these gorgeous pages as dividers in my Yellowstone Park Scrapbook and not cover them with photos. 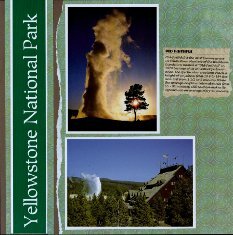 Scrapbook Advice Tip: You can always purchase the photos, kits and papers online at the Yellowstone National Park Bookstore. 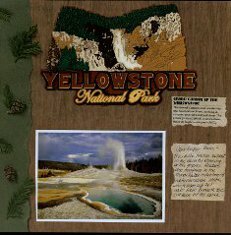 However, there are a number of other Yellowstone Scrapbook Layout & Supplies & Embellishment manufacturers that have products that are geared towards Yellowstone and they are available all over the country and on-line that can help make your own Yellowstone Park Scrapbook special. I hope you have found this collection helpful. 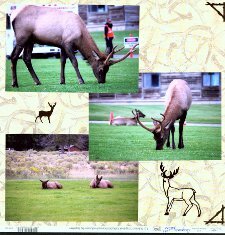 This is all we have completed at this point of our Yellowstone Park Scrapbook, but we will get some more posted at a later date when we have our own photos back from the Mega Road Trip for 2010.
and Road Trip Tips, Ideas and things to do along the way. Check out the Mount Rushmore Scrapbook. showing more of South Dakota. Or the Cody Wyoming Scrapbook. See over 70 Themed & Heritage Scrapbooking Ideas.